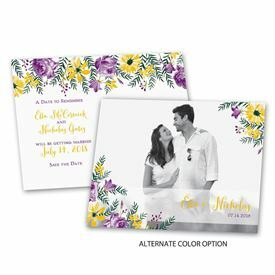 A gorgeous display of floral elegance borders your photo in vibrant color on these save the date postcards. Flowers are printed in your choice of colors. Your wording is printed on the front and back in your choice of colors and fonts. Choose save the date postcards and enjoy great savings on postage!